Whether you live in an apartment building or a house, we provide tailored charging solutions for all types of residences. As EV driving gains popularity, demand for charging at home will surely follow. 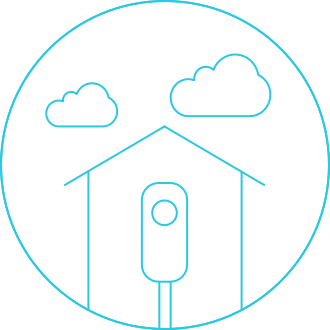 We facilitate residential charging by recommending tailored smart charging solutions for each specific home setting. Gone are the days of having to visit a station to “fuel up”. Now, you can have the freedom to recharge from your own home. NewMotion provides advice and support to end drivers so that they can maximise the potential of their home charging solutions while maintaining the highest safety and accessibility standards. Provide various options for home charging that all cater to specific end driver needs. Our charge points are smart, safe, and convenient for charging; all in a compact award winning design. Gain access to Europe’s largest public charging network. Using our charge card, drivers can easily locate public charge points, making on the road charging as easy and convenient as ever. Make your home charging simpler and more convenient with automatic reimbursement, insights and data, guest usage control, and remote start-and-stop. Access 24/7 around-the-clock customer support for any questions or concerns you may have. We are always on standby in case anything goes wrong. Our customer offerings were designed to guide and instruct them on their journey of from installation to implementing their smart charge infrastructure. To do so, we provided resources, insights, and advice into achieving the most efficient charging infrastructure that can cater to the customer's needs. Joan rolled out charging infrastructure for their private home and within weeks had set up their account, fit with recommendations, support, and relevant information to use the charge points efficiently. Assisted and recommended charging advice to End User depending on their location, charging needs, and available infrastructure. Provided installation support to ensure appropriate installation of the charge point. Provided access to my.newmotion.com for all insights and data into charging behavior. Also, granting access to the Public Charge Network for European wide public charging. Read about our charging solutions at home and on the go in this PDF.